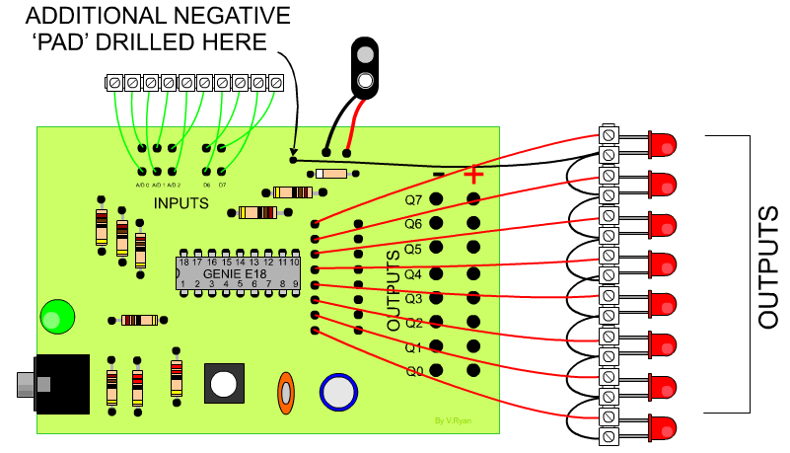 A simplier version of the GENIE E18 microcontroller circuit is seen below. The existing E18 PCB is given an extra ‘PAD’ (drill hole), which provides a negative connection (see normal and artwork diagrams below). Furthermore, the driver IC ULN2003 has been removed, reducing costs. The completed circuit board can be seen below. A black wire, from the new negative ‘pad’, is connected to a line of connectors. Loops of black wire, connect each of the negative pins/legs of each LED. When programmed, this circuit is powerful enough to drive LEDs and low power motors, such as solar motors. Components such as solenoids and relays, generally operate at 6 volts or greater. The outputs of this circuit are not powerful enough for these higher voltage components. Remember, the outputs on this circuit are straight from the GENIE E18 and do not pass through a driver chip. This alternative circuit is ideal for low power applications and projects. A simulation of the alternative circuit is seen below. The LEDs are powered directly by the GENIE E18 microcontroller. It was simulated on Circuit Wizard software. If a 6 volt supply is used, the outputs supply only 2.64 volts to the LEDs (according to the circuit, simulated on Circuit Wizard software). This means that they do not need protecting with 330R resistors.